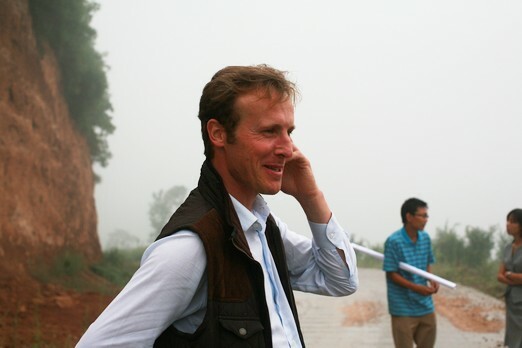 In this week's column, Jane Anson shares what she learnt from meeting terroir expert, Xavier Choné. You might not have heard of Xavier Choné, but if you have ever sipped or slurped your way through a tasting room you may well have seen his work. Most likely in Bordeaux, but Choné has worked across countless properties in California, Spain, Italy, Argentina, Chile, South Africa, the Lebanon, Morocco, Turkey and Russia. Even the remotest winery that I’ve visited, in the dizzying heights of the Himalayan mountains of Tibet, had a Choné original nestled in a drawer. This man is not an artist. Not exactly anyway. He does draw landscapes, but not of the Constable or Li Cheng variety. Curves and colours are not what he is looking for, although both of those things tell him a host of information that you and I might well miss entirely (particularly, he tells me, at harvest time, when the colours of leaves and the rate at which they are shed from vines spin a whole dialogue of their own). Choné’s tools are a little bulkier than your average painter – a set of trowels, shovels and spades, T-shaped soil probes and core samplers, plastic pails, sample bags and boxes, detailed GPS maps locating shape, altitude and geographic limits of vineyard plots. You’ve guessed by now of course. Choné is a terroir specialist whose particular skill lies in drawing maps of vineyard soils that explain exactly what is happening below the surface. He reads the submerged underbelly of the landscape and translates his findings into practical, actionable descriptions of the soils from acidity and pH levels, permeability, porosity, water retaining potential, structure, organic matter, micro-elements, nitrogen levels, carbon content, and most crucially the dominant materials that they are made up of – so whether flint, clay, limestone, gravel, sand, schist, what era they date from, how one interacts with the others, and which is dominant at different depths. ‘Terroir is the sense of a site,’ Choné told me the first time we met, over dinner at Château de Sours in Entre deux Mers maybe eight years ago. I’d heard his name plenty of times, but it was only after that supper that I started to take more notice of the discreet signature in a bottom corner of vineyard maps invariably found on walls in tasting rooms. The first one I noticed was at Léoville Las Cases in Saint Julien – which it turns out was also Choné’s first serious commission, around 20 years ago, mapping all 100 hectares of the vineyard. It was also, as far as he knows, the first in-depth terroir study commissioned by an individual château in Bordeaux; an event that is nowadays as commonplace for the best châteaux as a big-name wine consultant and a celebrity architect. Since getting his PhD in soil sciences and plant physiology, Choné has mapped around 2,000 hectares in the Médoc, perhaps 500 hectares in Saint Emilion and Pomerol, the same again in Pessac Léognan and Sauternes. As a student he was enlisted to study all 10,000 hectares of Entre deux Mers, plus a good amount of the non-vineyard land surrounding it to see what might be suitable for planting. To date, it is likely that this man has cut and sliced his way around 30,000 hectares of Bordeaux’s 117,000 hectares of vines, maybe one-quarter of the total. Worldwide, you can double that number easily, giving him an astonishingly wide-ranging overview of what makes a vineyard tick. So you can see why I picked up the phone to ask which parts of the region are most likely to be withstanding the heatwave that is currently gripping Bordeaux. ‘For a start, we are not in 2003 yet,’ he says. ‘That year saw three weeks of extremely high temperatures (high 30s°, low 40°s) and nearly two months without rain. We are closer to 2005, which in July saw one week of extreme heat followed by a normal dry year’. ‘At least 30mm of rain fell in early June, so most soils still have water reserves, and it is only the young vines that are really suffering; and maybe some pockets of dry gravel in Pomerol or Margaux. And don’t forget we are a long way from harvest – everything could change in a few weeks’. Warnings aside, this is what he had to say about hot years. That firstly you want to be looking for age/variety of vine + soil type + location + vineyard practices. And then you need to break that down even further. Take the age of vines, for example. In theory, older vines are better in hot years because the roots have widened and deepened enough to be a good conduit for any water reserves (‘the older the vine, the wider the pipe,’ Choné put it). But soil type is key – so Merlot on clay soils or particularly porous limestone, like the plateau of Saint Emilion but not the compact limestone around Frontenac, will have reached ‘old vine’ status by six or seven years old. A Cabernet Sauvignon on gravel soils won’t be considered old until it is at least 12 or 13 years. What you’re looking for, ideally, is clay, or a clay subsoil if there is gravel on top. So Lafon Rochet, Léoville Las Cases, Latour, Pétrus, the Corbin sector in Saint Emilion, Beau-Site, Montrose, Ormes de Pez and other clay-dominant areas of northern Saint Estèphe are feeling lucky right now, as are Haut-Bailly and Mouton, who both have plenty of clay in between their gravel. The limestone plateau of Saint Emilion will also offer relief to thirsty vines, so good news for Belair-Monange, Ausone, Clos Fourtet, Canon, Villemaurine – and certain parts of Entre deux Mers like Château de Sours, or Carbonnieux in Pessac Léognan, and most of Barsac. ‘Dry gravels are the ones that will suffer. Médoc grand crus are lucky because of their size, and because they have enough old vines – they always have enough cards to play with to make a decent first wine. Smaller estates in Pomerol and other areas simply have less land to pick from, so can find it tougher’. Just as he’s getting into full swing, he pauses. ‘The problem of course is that knowing which parts of the vineyard are going to respond best to drought doesn’t necessarily mean that you should do anything about it’. This is not someone who wants to paint himself as a guru, and no sooner is he impressing with his knowledge than he is talking himself out of a job altogether. ‘Bordeaux is still a maritime climate with vintage variation. If anyone had replanted with drought-resistant cultivars in 2003 or 2005, or uprooted all of their Merlot to guard against overly high alcohol levels, they might have been in trouble in 2011 or 2013’. ‘The other problem can be that vineyard mapping is a time-specific project. Ideally it happens by taking four to six samples per hectare, and is best done during winter when the vines are dormant and there is no water being drawn up through them, as inevitably taking samples later in the year will kill one or two vines. After it’s finished, we leave and the vineyard then has to act on the results – so it usually happens when an estate is looking at planting or making changes to rootstocks or grapes. Today many estates, such as Lafon Rochet or Opus One, prefer to take an ongoing audit of the water reserves and microbiology of soils over several years, understanding the practical implications to individual plots according to climate and age of vines. I like this approach – and like to always bear in mind that the best soils are no different from the worst unless there is someone to work them’.